Contemporary British footwear brand Harrys of London announces the arrival of New York City flagship store at 463 Park Avenue (Park Ave. & 57th St.). 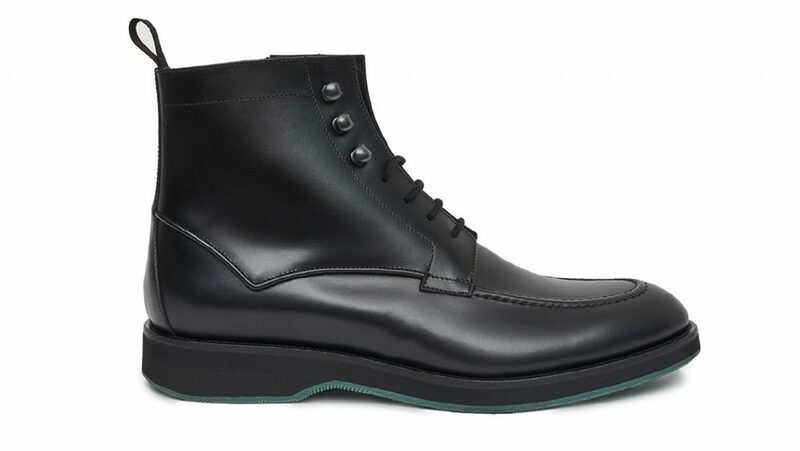 The revolutionary men’s shoe is engineered for comfort with patented technology, Technogel, designed by a podiatrist (foot doctor) exclusively for Harrys of London. The Technogel 3D sole coupled with its classic design make Harrys of London the 21st Century man’s wardrobe footwear essential. Harrys of London has already amassed a discreet following of celebrity clients comfortably fitted in their pair of “the shoe that feels like a sneaker”. They have been seen on the feet of Oscar and Grammy award-winning rapper Common who recently appeared on NBC’s The Tonight Show Starring Jimmy Fallon in a fresh pair. The 14-time Grand Slam Tennis champion Novak Djokovic was spotted off-the-court in his pair. Other celebrities include: Emmy award-winner Riz Ahmed, Screen Actors Guild Award-winner Joseph Fiennes, and The Brit Award-winner Tinie Tempah, Jason Statham, Nicholas Hoult, Michael Sheen, Richard E. Grant, David Harewood, Ralph Fiennes, Taron Egerton, Richard Madden, David Gandy, Sacha Baron Cohen, and Director Ridley Scott. The historic midtown Park Avenue is the perfect location for Harrys of London to gain their footing in the U.S. market and attract the attention of the men’s fashion community. As the commuter neighborhood sees all walks of life, Harrys of London promises to take care of your feet in their functional, comfortable shoe designed for day-to-night wear. Ranging in price from $395.00 to $695.00, the Autumn/Winter 2018 styles include: the Bolt 2 (noble suede, tech leather) (anthracite, black, black/blue, black/white, navy/red), the Court Sneaker (calf, tech leather, nubuck) (black, white/navy), the Ethan (black, dark brown), the Mr. Jones (suede, chinchilla) (black, dark brown), the Tom (nappa, tech leather) (black, green, navy, orange, white), the Tom Therma (nubuck, tech leather) (black, dark brown/black, black), the Track (tech leather) (black/white, white/black), the Tube (tech leather) (black, white) the Basel 3D (kudu, tech leather, tumbled calf) (espresso, green, grey, midnight, orange, tobacco, black, dark brown, navy), the Downing F 3D in satin (black, burgundy, dark brown, navy), the Clive R (suede, polished calf) (black, dark brown, navy), the Eddie (brush-off calf) (black), the Edward Soft (deerskin, suede, supple calf) (black winter, dark brown, navy winter, black, brown, green winter, navy winter, rust), the Eton (satin calf) (black, dark brown) the Hugo (patent/grosgrain) (black), the Paul M (polished calf, satin calf) (burgundy, black), the Alex M (polished calf, satin calf) (dark brown, black), the Mark R (satin calf, polished calf suede) (black, dark brown, navy), the Blenheim (calf hair) (black), the Hartfield (kid suede, lamb fur) (black, dark brown), the Howard (deerskin) (black, dark brown). Synonymous with innovative design, high quality manufacturing and modern style, Harrys of London is a quintessentially British contemporary brand. When the iconic brand was conceived in London in 2001 by Matthew Mellon, the purpose was to create ‘shoes that feel like sneakers’, and the business defined a new category. The concept started with the elegant, sporty lines and unique sole of the popular DOWNING loafer, followed by the soft, unstructured Basel moccasin. These styles which we now refer to as ‘the iconics’ were instantly popular and became the benchmark for everything that followed. Today the brand continues to deliver the ultimate wearing experience for men who do not wish to sacrifice style for comfort and vice versa. For more information about Harrys of London, please visit www.harrysoflondon.com.